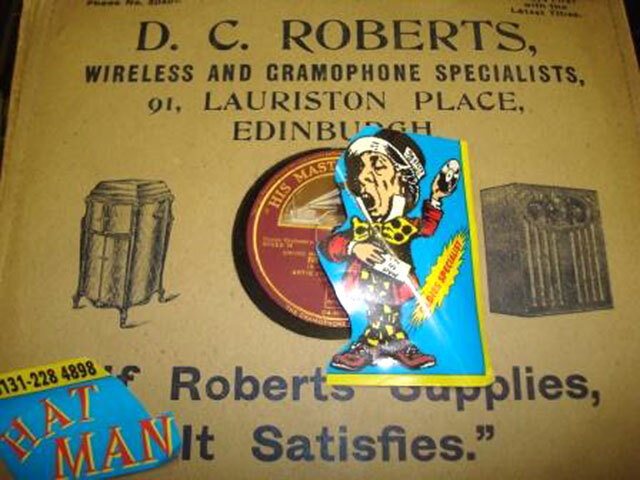 "Alan Raeburn in Tollcross Recollections 4 asks about a record shop in Brougham Street that sold 45s. The figure in the first photo on this page is 'The Mad Hatman'. 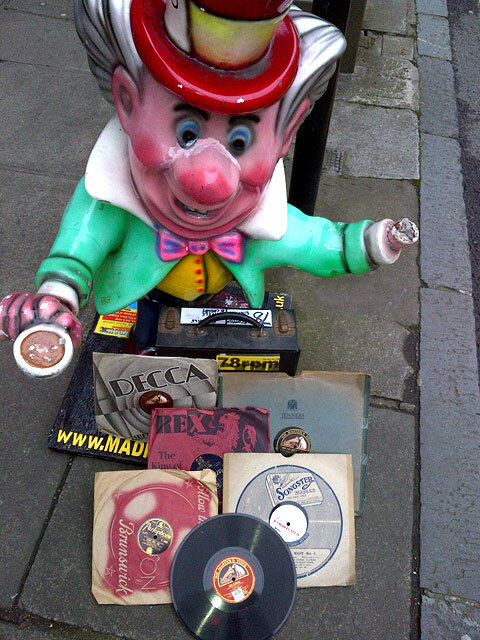 As well as owning Backtracks Music and Games Shop at Tollcross, Tommy runs Mad Hatman Discos. "These record covers are from Clifton's. Their shop was just to the west of JW Mackie in Princes Street. Thank you to Winnie Lisowski, for writing about several music shops in Edinburgh. Between 1953 and 1957, I went for piano lessons at Methven Simpson in Princes Street. My teacher was Mr Alfie Weston. It was a very large shop. It sold all types of musical instruments on the ground floor and music lessons of all kinds took place upstairs." "Methven Simpson were at No 83. They sold pianos, sheet music and radios, and were well frequented by music lovers. They were next door to The New Club (at No 85) where my mother did the odd function as a waitress, being sent there by Mackies"
There was also Gordon Simpson's shop in Stafford Street which sold loads of instruments. Maybe there was no connection at all but found it fascinating that the Simpsons were all connected with music. "There was a shop in Brougham Street, Tollcross was called 'Hot Wax'. However, I remember 'Hot Wax' as selling only LPs." "Hot Wax started up in Stockbridge then moved to Dalry Road and eventually to Tollcross but as the shutters were always halfway down. I don't know how long it existed there." "The Other Record Shop was in St Mary's Street. Graham Ingram ran this shop. "GI Records opened in St Cockburn Street Street in the 1970s. "The Record Exchange in Clerk Street is the oldest shop I recall in Edinburgh.  "I notice the absence of any mention of Bandparts above. 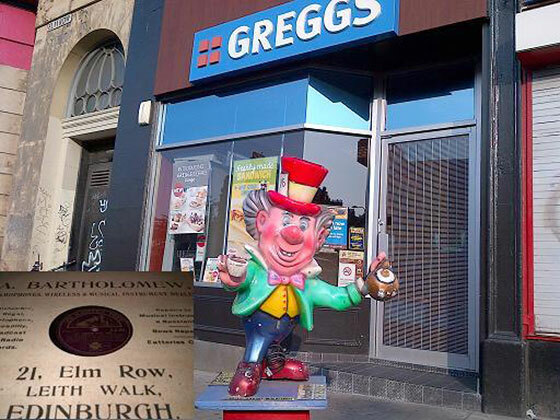 They had a shop near York Place, near Gayfield Square, and latterly near the foot of Leith Walk." "In great Junction Street, near the corner of Bonnington Road, was Ard radio. As the name suggests, it was a place that sold audio equipment but it also had a good record selection." 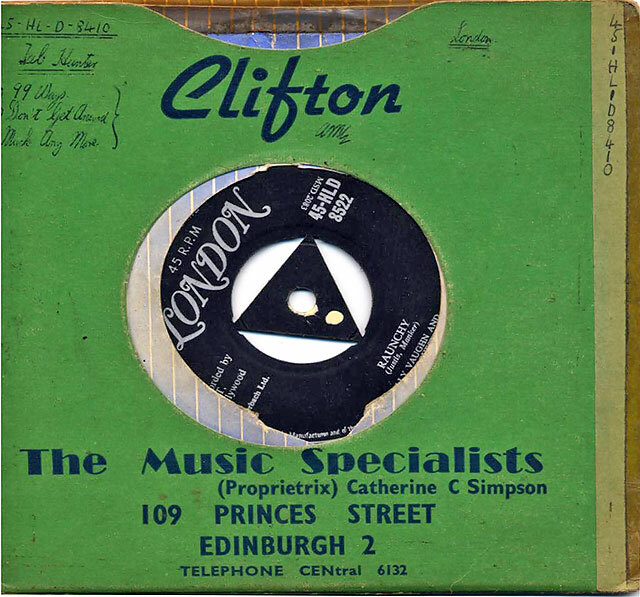 "I bought my first '45' record from a record shop in Bread Street, just opposite the ABC Cinema on Lothian Road. If memory serves me, it was called Jeffrey's. Back then you got to listen to the record before buying it." "What I do remember about The Other Record Shop was that it was always packed to the door every time I went. Graham then opened another shop round the corner in the High Street which seemed to do well too. I loved those days, browsing through LP's covers admiring the art work - a thing you can't do now!" "Robert Laird's memory in Recollections 6 above is correct. The full name of the shop was Jeffrey's Audio House. I bought my first single there in 1963, when they cost 6/8 each - 3 for £1. Major albums usually cost 32/6, although cheaper popular labels were available. 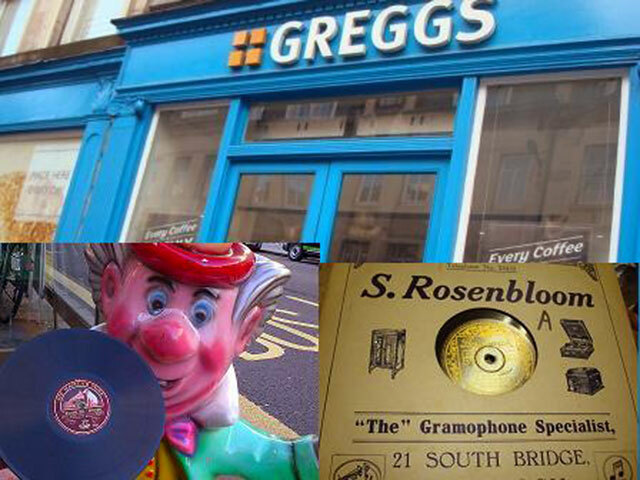 "GI Records, run by Gordon Inglis and mentioned by Winnie Lisowski, was later in Raeburn Place, Stockbridge for a while in the 1970s." Thank you to Tommy Robertson for writing again. 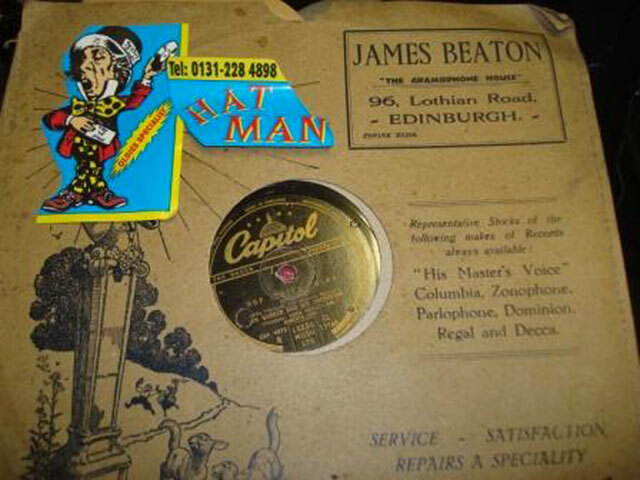 "I've been looking into the history of record dealers in Edinburgh. 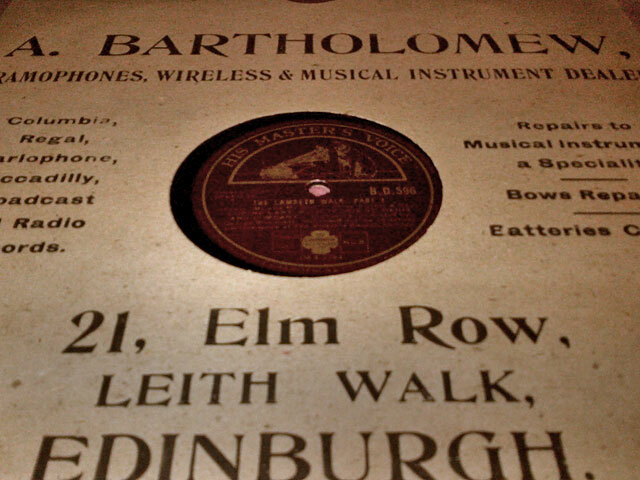 Can anybody tell me anything about A Bartholomew, Gramophone and Radio Dealers? Their shop was at 21 Elm Row many years ago, before my time. The shop has now become Greggs bakers shop. Perhaps this recent photo will jog a memory." I don't know for how long the Bartholomew shop was at 21 Elm Row, but it seems to have been there for quite a while. The Edinburgh & Leith Post Office Directories show that it was there in 1930 and still there in 1950, but gone by 1960. 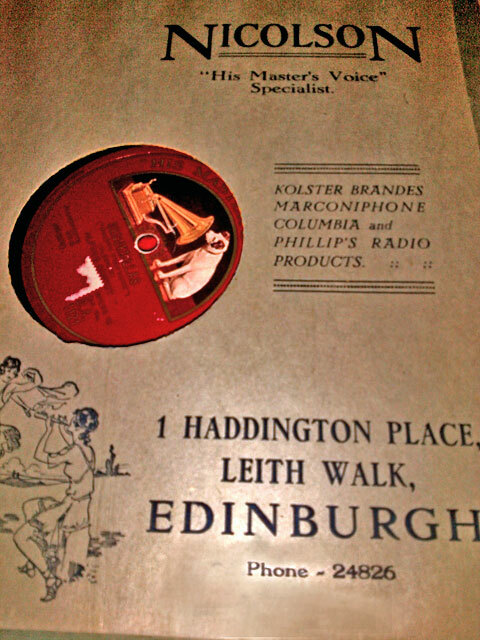 "Maybe these photos of original gramophone record sleeves, showing the addresses of the Edinburgh shop premises where the records were sold, will stimulate readers to add their memories." - Cairn’s Coffee and Record Shop. and their like had stimulated an interest in those US blues and soul singers and groups that had influenced the UK bands. mainly as singles. 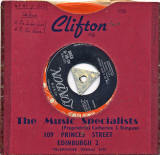 At that time, these recordings were just not widely available elsewhere in Edinburgh.  Its range of records reflected contemporary developments in both folk music and jazz. amongst others had led to a revival of interest in folk music. ... and weren’t students meant to be most receptive to new musical forms? The shop's location was not an accident.  As with the blues recordings, much of the stock was imported from the US. The Cairn’s hybrid model was very much akin to The Grail model. - The Grail was a bookshop that sold tea, coffee and eats, or was it a tea/coffee shop that sold books? - Cairn’s was a record shop selling coffee, or was it the other way round?  Either way, the sum was reckoned to exceed the parts. It would be many years before Waterstones revived the Grail model for books – and, to my knowledge, the hybrid record shop has yet to be revived in Edinburgh." "I notice that nobody has yet mentioned Bruce’s Record Shop. It used to be in Shandwick Place. I remember buying some Emerson, Lake & Palmer albums on audio cassette there. That must have been after I started working, so around 1976." The slogan was printed on their carrier bags, which were bright red with black lettering, if my memory is correct. Clearly, the slogan was well-known enough for him to assume that people would get the joke." - 'I found it at Bruce's' bags. They were red and black bags, square LP size and smaller 45rpm size. - 'I found Bruce at it' T shirts, in similar colours, I think. "Before the shop moved to Shandwick Place, it used to be in small premises in Rose Street in the early 1970s, ,just on the right hand side if you entered Rose Street from Hanover Street, heading west. I remember listening to David Bowie's newly released 'Hunky Dory' album on Bruce's headphones, inside the shop, so it was probably 1972-1974 at latest. There was also a rival record shop that appeared on the scene in tiny premises somewhere near Thistle Street: Virgin Records. They used to be playing their own record label's Tubular Bells by Mike Oldfield every time I passed by." - 'Virgin Records Ltd.' was founded by Richard Branson in 1972. "The Record Exchange that used to be in Elm Row is now a chip shop. It was a branch of the Record Exchange of Clerk Street, located South of the New Vic Cinema. Records were expensive in the 1950s and 1960s." "There was also another Record Exchange in the Lawnmarket where the Bank of Scotland is now located. The owner of that shop wrote an interesting book about his business in Edinburgh and he also ran a well known Restaurant called ‘The Farmhouse’ in Princes Street. His book is in the Edinburgh Library on George IV Bridge."